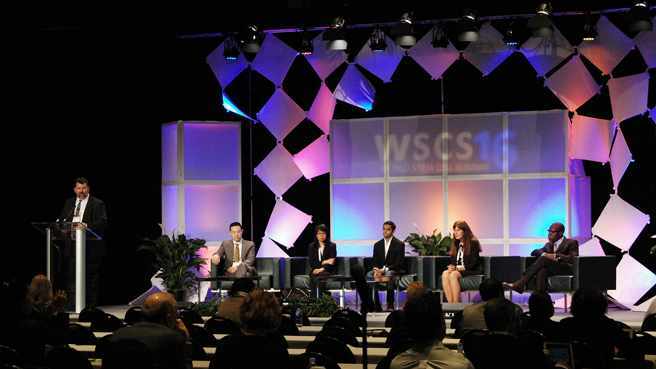 Medical research scientists, academics and clinicians mingled with entrepreneurs and patient advocates at the World Stem Cell Summit recently in West Palm Beach, Florida. In its fourth year as co-sponsor, Mayo Clinic Center for Regenerative Medicine sent a delegation to discuss the promise and the peril of the advancing science with about 1,200 attendees. Topics ranged from cardiovascular regeneration to growing stem cells in a microgravity environment in space. About 300 health care consumers were asking questions and engaging in discussions with presenters on Public Day. Karen Krucker, stem cell therapy program manager at Mayo Clinic, explained what patients and their families need to know before receiving stem cell or regenerative medicine treatments. Krucker worked at the Regenerative Medicine Consult Service at Mayo Clinic, the first consult service established in the United States to provide guidance for patients and families regarding stem cell-based protocols. In her role, instead of giving medical advice, she educated patients on how to make an informed decision. “You need to be very careful. You need to have skepticism,” she told the audience. “Even injecting stem cells from your own fat cells can have risks.” Rest the rest of the article.